En: Finaly it was warm enough to show you my suit by Lavish Alice. Earlier I showed you the cape blazer and now you can also see the shorts;) The shorts are high waisted which I love to combine with cropped tops. Like you probably noticed in my post about the cape blazer, I'm in love with this brand. They also got this blazer with a banana leaf print, so cool! The cropped top is by Asos and the heels by Sacha. Wauw, wat een prachtige look zeg! Wow, echt heel gaaf! Ik vond de cape op zichzelf als super maar zo als setje is het zelfs nóg mooier! Hele toffe outfit, staat je goed! Ik vind je hakken trouwens ook zo leuk voor de zomer! 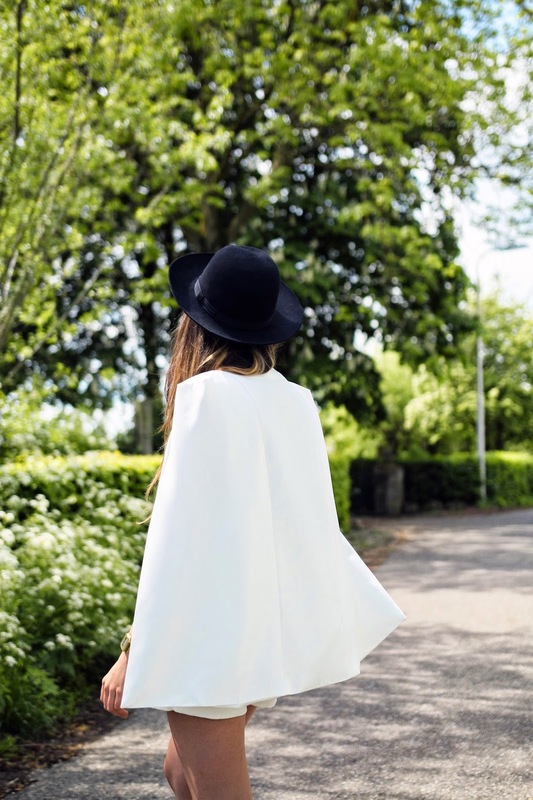 love everything you are wearing, especially the cape jacket! such a great look! Lovely outfit! Followed you on facebook, maybe we can follow each other. Wauw, wat een prachtige outfit zeg! En hele mooie foto's!